Situated at Sahyadri Hills, Amboli is one of the most popular hill stations of the state of Maharashtra. The hill station is known for many fascinating waterfalls, beautiful natural sights and fresh air. The native language of the region is Marathi and Hindi is also widely spoken in the region. Amboli is situated at the altitude of 690 m and has pleasant weather throughout year. Its temperature ranges from 22 to 40c in summer and from 12 to 33c in winter. The best time to visit Amboli is from October to March. 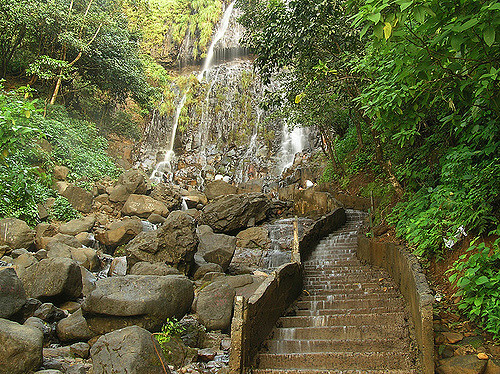 Amboli is home to many natural sights and amazing water falls in and around it. is a beautiful water fall and one of many major tourist attractions in the region. The water fall is very fascinating to see water falling down beastly. It is a major picnic spot for many tourists. which is just 10 km away from Amboli and it is located in Sindhudurg district of Maharashtra. Though the water fall is small one but it draws attractions of many tourists. is a historical important place of Amboli. It was four times bigger than the famous Shaniwarwada of Pune, Maharashtra. Though the fort is now in its ruins state, it offers tourist beautiful views of nearby forest including wonderful view of Konkan and Arabian Sea. is religious important place of Amboli. The temple is old one and it is believed that the person who built this temple was the manifestation of Lord Shiva. The temple is very sacred and peaceful place. Bauxite mine are just 10km away from Amboli and it offers visitors many beautiful landscape views. Amboli is well connected by road to many other cities and town of the state and the country. Many state run buses and private luxury buses connect the hill station to many other parts of the state and the country. Also several car hire companies offer a convenient shuttle service right from the major nearby cities to Amboli at affordable price. Nearest railway station to Amboli is Sawantwadi railway station which is just 30km away from Amboli. Sawantwadi railway station is connected to many other cities of the state and the country. The nearest airport for Amboli is located in Goa which is connected by many domestic flights to many major cities like Mumbai and Bangalore. International flights are connected to Mumbai airport which is about 555 km away from Amboli.